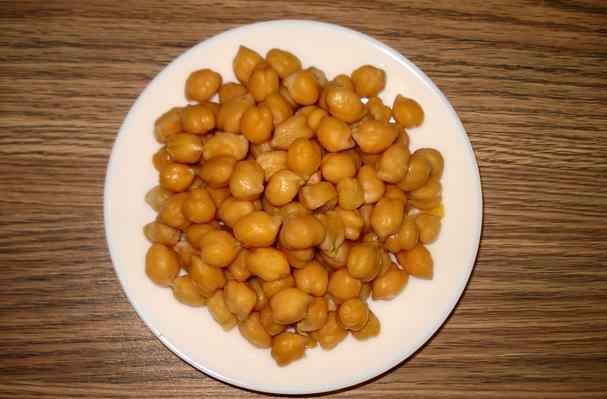 Fresh Garbanzos offer many health benefits such as promoting a healthy digestive tract, reducing the risk of some types of cancer, controlling diabetes and maintaining healthy blood glucose levels. Chickpeas (or garbanzo beans) are a bean that is high in protein and fiber. They are most commonly grown in the Mediterranean, Western Asia, and India, and are a staple in those cuisines. Whole beans are common in soups and salads, while ground beans are used to make falafel, hummus, or gram flour. Chickpea flour is sometimes used as a substitute for wheat in gluten-free cooking. The physical pea comes from a plant that grows aprox. 1 to 2 feet high that grows ina tropical to sub-tropical area. Some peas have a roungh coat and some have a smoother coat depending on where they are grown. Garbanzos have a delicious nutlike taste and a texture that is buttery, yet somewhat starchy and pasty. A very versatile legume, they are a noted ingredient in many Middle Eastern and Indian dishes such as hummus, falafels and curries. While many people think of chickpeas as being in beige in color, other varieties feature colors such as black, green, red and brown. Choosing: Dried garbanzos are generally available in prepackaged containers as well as bulk bins. Just as with any other food that you may purchase in the bulk section, make sure that the bins containing the garbanzo beans are covered and that the store has a good product turnover so as to ensure maximal freshness. Whether purchasing garbanzos in bulk or in a packaged container, make sure that there is no evidence of moisture or insect damage and that they are whole and not cracked. Canned garbanzo beans can be found in most supermarkets. Unlike canned vegetables, which have lost much of their nutritional value, canning does less damage to many of the key nutrients found in garbanzo beans. For example, many people rely on garbanzo beans (and other legumes) for protein and fiber in their daily diet, and canning only lowers the amount of these nutrients by about 15%. Many of the B vitamins hold up well in canned garbanzo beans, and some actually show up in higher concentrations in canned versus non-canned versions. An important exception here is folate, which is decreased by about 40-45% during canning. (If you are depending on your chickpeas for this important B vitamin, you will want to consider purchasing dry garbanzos and cooking them yourself.) Canning will generally lower the nutrient content of food since long cooking time and/or high heats are often involved. The nutritional impact of canning on vegetables can be extremely high since vegetables are best cooked very lightly for a very short period of time. Legumes like garbanzo beans are different than vegetables, however, since they require a long time to cook whether they are canned or cooked by you at home from the dry version. Therefore, if enjoying canned beans is more convenient for you, by all means go ahead and enjoy them. We would suggest looking for those that do not contain extra salt or additives, and once removed from the can, placed in a strainer and rinsed thoroughly for one minute. (One concern about canned foods is the potential for the can to include a liner made from bisphenol A/BPA. To learn more about reducing your exposure to this compound, please read our write-up on the subject). If purchasing chickpea flour, more generally available in ethnic food stores, make sure that it is made from chickpeas that have been cooked since in their raw form, they contain a substance that is hard to digest and produces flatulence. Buying: You can buy Garbanzo Beans at your local grocery store. To shorten their cooking time and make them easier to digest, garbanzo beans should be presoaked (presoaking has been found to reduce the raffinose-type oligosaccharides, sugars associated with causing flatulence.) There are two basic methods for presoaking. For each you should start by placing the beans in a saucepan and adding two to three cups of water per cup of beans. The first method is to boil the beans for two minutes, take pan off the heat, cover and allow to stand for two hours. The alternative method is to simply soak the garbanzos in water for eight hours or overnight, placing pan in the refrigerator so that they will not ferment. Before cooking them, regardless of method, skim off the any skins that floated to the surface, drain the soaking liquid, and then rinse them with clean water. To cook the garbanzo beans, you can either cook them on the stovetop or use a pressure cooker. For the stovetop method, add three cups of fresh water or broth for each cup of dried garbanzo beans. The liquid should be about one to two inches above the top of the legumes. Bring them to a boil, and then reduce the heat to simmer, partially covering the pot. If any foam develops, skim it off during the simmering process. Garbanzo beans generally take about one to one and one-half hours to become tender using this method. Store dried garbanzo beans in an airtight container in a cool, dry and dark place where they will keep for up to 12 months. If you purchase garbanzos at different times, store them separately since they may feature varying stages of dryness and therefore will require different cooking times. Cooked garbanzo beans will keep fresh in the refrigerator for about three days if placed in a covered container. Chickpeas are mentioned in Charlemagne's Capitulare de villis (about 800 CE) as cicer italicum, as grown in each imperial demesne. Albertus Magnus mentions red, white and black varieties. Nicholas Culpeper noted "chick-pease or cicers" are less "windy" than peas and more nourishing. Ancient people also associated chickpeas with Venus because they were said to offer medical uses such as increasing sperm and milk, provoking menstruation and urine and helping to treat kidney stones. In 1793, ground-roast chickpeas were noted by a German writer as a coffee substitute in Europe and in the First World War, they were grown for this in some areas of Germany. Chickpeas are still sometimes brewed instead of coffee. History: Domesticated chickpeas have been found in the aceramic levels of Jericho (PPNB) along with Cayönü in Turkey and in Neolithic pottery at Hacilar, Turkey. They are found in the late Neolithic (about 3500 BCE) at Thessaly, Kastanas, Lerna and Dimini. In southern France Mesolithic layers in a cave at L'Abeurador, Aude have yielded wild chickpeas carbon dated to 6790±90 BCE. By the Bronze Age, chickpeas were known in Italy and Greece. In classical Greece, they were called erébinthos and eaten as a staple, a dessert, or consumed raw when young. The Romans knew several varieties such as venus, ram, and punic chickpeas. They were both cooked down into a broth and roasted as a snack. The Roman gourmet Apicius gives several recipes for chickpeas. Carbonized chickpeas have been found at the Roman legion fort at Neuss (Novaesium), Germany in layers from the first century CE, along with rice. Nice to know about this useful information about chickpeas. These dried Garbanzos are my favorite.